It's a new hack that features absolutely NO change in level design. Instead, Control Freak features a significant overhaul of the gameplay controls. Run is now toggleable between Run and Walk. Moonwalk has been deleted, and the setting is now used to toggle Auto Run. Aim Up is now the only aim button, 'Aimlock'. Holding it will make Samus aim at a certain angle, and aim higher or lower if you tap up or down. Samus also has the ability to run and aim straight up at the same time now. Select Item will still be used to select missiles, super missiles, power bombs, or the grapple beam. 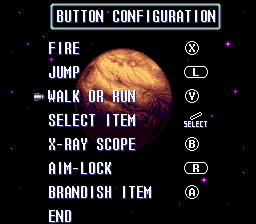 It no longer selects X-ray, which now has its own button. Items that are empty can be selected, but of course will not be used. Beams can still be used at any time, even when missiles and super missiles are selected. Aim Down has become Brandish, which, when held, will toggle between Beams and the item currently selected. This is somewhat... abusable. 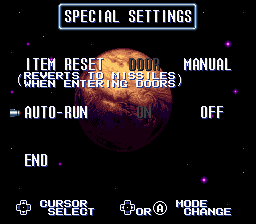 :) Beams can be charged and remain charged while you fire missiles, but you still have to wait for cooldown till you can release a charged shot, or else you'll just waste your charge. Powerbomb attacks are also now easy to control, just tap Brandish when you want to trigger them. Spinjump controls have also been improved a bit - Walljumping should be a bit easier on a d-pad, and Samus will fire in the direction you're pressing instead of just forward, if you press fire. The controls are configurable to ANY combination. Aim is not limited to L and R.
And for some disclaimers... This hack is a bit of a rushjob. I have not spent much time bughunting, but I have fixed nearly every bug I've run into. If you run into any bugs, mention it and I'll try to fix it. There's one minor graphical bug I haven't fixed: If you start charging and brandish a missile, the charge graphic will continue to grow but the charge counter will not actually increase. There's no good way to fix this, unfortunately, but you can tell if you have a full charge still if Samus is flashing. Also, while Japanese text won't break the game, I haven't adjusted the Japanese menu screens for the hack, so they'll be off. None of the item box messages have been edited either. Feel free to use it in your own hacks or whatever.